The significance of the Aetherion Core's destruction is unknown. As such, it us unknown if the Celestial is alive or dead. Ahzidal (meaning "the Embittered Destroyer" or literally "Bitter Destroyer" in the Dragon Language) was the first great Nord enchanter, and possibly the first human to master the Elven methods of enchanting. He was born in the city of Saarthal late in the Merethic Era and his talent for magic and enchanting was quickly noticed. As he grew, his talent quickly surpassed that of his instructors and of every person living in Saarthal. Eventually, finding he could progress no more among his own kind, he left his home and sought out Elven instructors who could teach him more, leaving behind everyone he knew, including his wife and child. He was gone for several years, learning all that he could, but when he returned he discovered his home destroyed, burnt to the ground by the Elves, and everyone he knew dead or gone. He swore an oath of vengeance, taking the name Ahzidal, meaning "the embittered destroyer". He would go on to fulfill that oath, but at the cost of his sanity. The leader of the Altmer Direnni Clan who won many battles against the Alessian Empire, culminating in his victory at the Battle of Glenumbra Moors in 1E 482, at the cost of greatly weakening his clan's power. Queen Akorithi was the Queen of Sentinel and wife of King Camaron. She was the mother of Arthago, Aubk-i, Greklith and Lhotun. Alessia, também conhecida como Rainha Alessia ou Santa Alessia, liderou a rebelião da Primeira Era contra os Ayleids, liberando os humanos de Cyrodiil da escravidão e fundado o que se tornou o Primeiro Império Cyrodilico. Como sua primeira Imperatriz, ela estabeleceu uma nova religião, uma fusão dos panteões Nórdico e do Aldmeri, conhecido como Oito Divinos. Em seu leito de morte em 1E 266, ela foi santificada por Shezarr (em algumas histórias por Akatosh), sua alma foi colocada na pedra central do Amuleto dos Reis. O Pacto entre deuses e homens foi feito aqui. Belharza o Homem-Touro, seu suposto filho com o semipríncipe Morihaus, foi eleito como seu sucessor como Imperador de Cyrodiil. Alessia não é seu nome de nascença, e sim a alteração de um título, Al-Esh ("Alta Alteza"), que foi dado a ela por seus seguidores. Outro título dado a ela foi Paravant ("A Primeira"). Devido a alteração desses dois títulos, existem outros inúmeros nomes pelos quais ela é conhecida por várias pessoas, incluindo Perrif, Paravania, e Aleshut. A Ordem Alessiana é chamada assim pois ela supostamente apareceu numa visão do profeta Marukh, e concedeu seus ensinamentos a ele. Para mais informações, veja o artigo completo sobre Alessia. Alisanne Dupre was a member of the Dark Brotherhood who had become the Listener of the Black Hand by the year 4E 187. 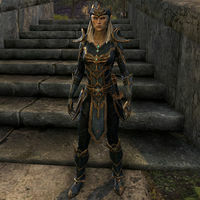 When the feud between Bravil's two largest skooma traffickers turned violent, Dupre was forced to hire a battalion of sellswords to protect her and her property. Ultimately the effort proved futile, and Dupre was killed while attempting in vain to guard the Night Mother's crypt from desecration, incinerated by a fiery spell cast by a mage. Circa 3E 433, Kathuetet was ordered by Dagon to serve Mankar Camoran in Gaiar Alata. He was charged with keeping order in the Savage Garden, where the souls of "unmortal" Mythic Dawn members took part in ceaseless combat to prove themselves. Anaxes was appointed Lord of the Savage Garden, and became feared by the cultists as the worst of their tormentors. The cultists eventually succeeded in trapping him in a cave. Although Kathuetet regarded the humiliation of his imprisonment as a fitting punishment, Anaxes' shame made mockery of Kathuetet's authority. Seeing the matter as too insignificant for his own attention, Kathuetet attempted to bring the Hero of Kvatch into his service in order to free the Xivilai. The outcome of this proposition is unknown, and Gaiar Alata was destroyed shortly afterward. Count Andel Indarys was a member of House Hlaalu in Morrowind who went on to become the Count of Cheydinhal in Cyrodiil. He married his wife, Lady Llathasa Indarys, around 3E 413, and they had one son, Farwil Indarys. He was the only Dunmer count in Cyrodiil at the close of the Third Era. It's speculated that the Queen Mother of Morrowind, Barenziah, wielded her influence to put him on the throne. The Ayleid king of Abagarlas, a city of Molag Bal worshipers in a deadly feud with the Meridia-worshiping people of Delodiil. During the course of the cities' war, Anumaril began preparations for a necromantic ritual, the Mortuum Vivicus, which would drain all life from Delodiil. This prompted a daring raid by the Meridians, who were able to infiltrate Abagarlas, kill Anumaril's entire family, and destroy the city entirely. It is not known what became of Anumaril after his city's annihilation. Arden-Sul was a powerful prophet and ruler from an old time in the Shivering Isles. The events of his life and death are widely disputed by the people of the Isles, particularly in regards to the Sacellum. As with everything else in the Isles, the division in viewpoints lies between Mania and Dementia. The only thing the ruling powers seem to agree on is that he was a prophet who preached in the building that shares his name, the Sacellum Arden-Sul and had 213 followers. The Manic and Demented versions of his death have even become part of the ritual of accession for each respective duchy. A longer version of his life can be found in the book The Prophet Arden-Sul. Not much is known about Arden-Sul. Some say he was a hero, some say he is some sort of god. The Heretics believe that Arden-Sul is the true lord of the Shivering Isles and that Sheogorath is just a man who needs to be overthrown. The Zealots believe that Sheogorath is a living god (an Aedra bound in human form) and that Arden-Sul is the personification of Sheogorath's mortality. The beliefs of the maniacs and the demented contradict each other almost completely. Father to the future Daggerfall King Lysandus. 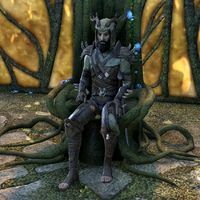 Described as one of the many pretender kings of the Interregnum, the warlord Attrebus claimed the Imperial Throne sometime prior to 2E 812 and mounted a campaign to rid Cyrodiil of foreign influence by expelling Akaviri. Attrebus produced a line of successors who were later usurped by the remnants of the Kamal army that unsuccessfully invaded Tamriel in 2E 572. Prince Attrebus Mede was the son of Emperor Titus Mede. Queen Aubk-i was born to King Camaron and Queen Akorithi of Sentinel. She was sister to Greklith and Lhotun. She was married to Gothryd of Daggerfall, and became the new Queen when Gothryd ascended the throne in 3E 403. </noinclude> Rainha Ayrenn Arana Aldmeri de Alinor foi uma líder do Domínio Aldmeri na Segunda Era. Ela nasceu em 5 da Segunda Semeadura de 2E 555, filha do Rei Hidellith e sua mãe Dama Tuinden, e toda a Ilha do Semprestio celebrou por cinquenta e cinco dias. Ela era ágil e inteligente em sua juventude, e desapareceria por dias a fio. Em 2E 573, em meio a muitos sinais, ela desapareceu, e seu irmão Naemon foi eventualmente apontado como herdeiro do trono. Existem muitos mitos sobre como Ayrenn passou esses anos, mas quando seu pai morreu em 2E 580, ela reapareceu na Enseada Velyn, para a surpresa de todos, clamou seu direito de sangue, se tornando Rainha em 7 da Queda de Gelo (por isso o nome, a "Rainha Imprevista"). † There is reference to an Ayleid arch-mage named Anumaril at the time of the Alessian Slave Rebellion, who tried to recreate the Tower of White-Gold in Valenwood. Furthermore, the first known reference to the Remnant of Light suggests that it was originally in Cyrodiil, but that Anumaril sent the artifact to the northwest shore during the rebellion. However, it's not known whether these documents are referring to the same person as King Anumaril of Abagarlas. Esta página foi modificada pela última vez à(s) 02h56min de 24 de janeiro de 2016.